Denmark and the Netherlands are the safest places on the planet to ride bicycles. Full stop. Unfortunately, cyclist - and pedestrian - lives are lost in collisions with motorists despite best and largely successful efforts to reduce loss of life. A few days ago another life was lost when a truck driver wasn't paying attention when turning right. This time it was a six year old boy on his way to school with his 12 year old sister. The truck driver was turning right and the children were heading straight on, on a cycle track. The truck driver hit and killed the boy, crushing him under the front wheels. The truck driver didn't check his mirrors and didn't see them. He said that he was watching a moped coming up in the distance from behind and didn't look to see if there were any cyclists next to him. I don't need to elaborate on how tragic this is. We can call figure that out and reflect on it personally. Three cyclists have been killed in right-turn incidents this year. Two of them six year old boys. What is absolutely disgusting is the reaction from the Union of Free Danish Truck Drivers (Forbundet for Frie Danske Lastbilvognmænd (FDL)). Just when you thought you've seen and heard it all, you read that they are "furious" about the DCF's and Social Democrats' comments. The DCF demands that trucks come to a full stop before turning right. 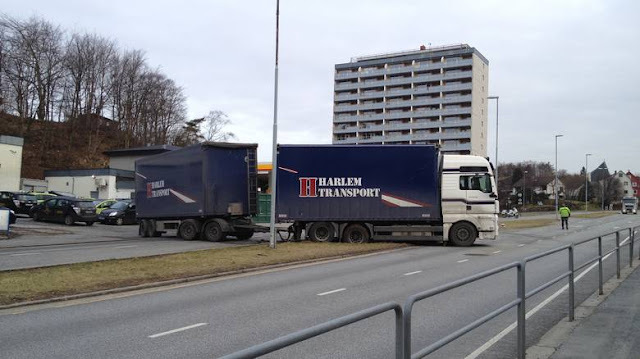 "The FDL would once again like to remind the DCF that trucks don't drive around cities for fun and that very few truck drivers like driving in city traffic, not least because of the many dangerous situations that occur in connection with the heatedly-discussed right turns", says the editor of the trucker union's newsletter, Peter Skjøth, in a press release. According to the FDL, the cyclist federation should look inwards because it is - according to the truckers - cyclists who ride dangerously and are the greatest sinners. "We shouldn't consider the latest accident, but merely note that in only a few right-turn accidents can the driver be blamed. 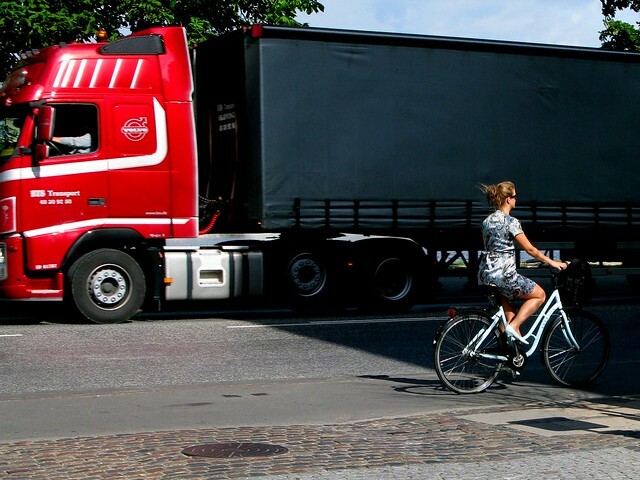 There are many examples of cyclists suddenly appearing out of the blind spots and taking the chance to continue straight on, even though they can see that the truck driver has begun a right turn", says Peter Skjødth. He underlines that FDL is not seeking to remove itself from the responsibility that every driver of a motor vehicle has. But traffic safety can only be improved when all traffic users make an effort. The Social Democrats are also under fire. On Tuesday, the traffic spokesman, Rasmus Prehn, sendt a declaration of support to the Cyclists Federation. "Perhaps Rasmus Prehn and a large group of his colleagues in the transport and justice committees should spend some days in trucks and on sidewalks to follow the thousands of irresponsible cyklists who day after day create dangerous situations." "It is trafic when a person dies in the traffic and it is extra powerful when it is a six year old boy like last Tuesday, but it is completely insane that the boy's trafic death is used as ammunition against those who bring goods out to the shelves", says the Union of Free Danish Truck Drivers. I finished translating that and I've been sitting here staring at the computer. Not quite sure how to continue. The statements are so shocking, so completely devoid of facts that it seems unreal. In a way, Peter Skjødth has done an excellent job in exposing his - and the union's - callous indifference about the death of a boy under the wheels of one of their truck. This is one of the many situations where the use of the word 'accident' seems so wrong. The truck driver killed a boy because he didn't pay attention. It's situations like these when you wonder why this isn't considered murder. The police have said that the driver may be charged with involuntary manslaughter - which can result in up to four months of prison - up to 8 years in extreme circumstances. Is that enough? Should the truck driver be allowed to continue working? The truckers' union doesn't seem to be very concerned about saving lives and working towards more and better mirrors for their trucks, tech solutions to avoid their drivers killing and injuring people on the streets or anything that means much to society at large. There is nothing on their website about a desire to reduce truck traffic in cities by working with modern solutions like depots outside built-up areas and smaller vechicles delivering the last few kilometres. I'm going out on a limb and assuming that the Truckers' Union are ignorant about what is happening in cities around the world. Even the City of Copenhagen is working on a City Logistics project that will keep the trucks out of our city. Isn't this an appropriate time to mention the groundswell of public protest in the Netherlands in the 1970s against Child Murder on the streets? 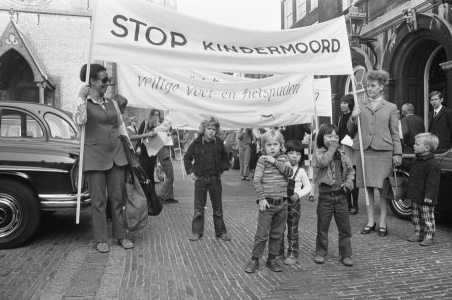 Stop Kindermoord - Stop Child Murder - was a massive campaign to raise awareness about the slaughter of citizens - cyclists and pedestrians alike - by motor vehicle drivers, including truck drivers. Two six year old boys have been killed by trucks this year and here in my neighbourhood late last year, a ten year old girl was killed by a motorist. We're certainly not at the levels of deaths we were at in the late 1960s and early 1970s in Denmark or the Netherlands but we still haven't been able to control the rampage of automobile traffic and, not least, trucks turning right. The Truckers' Union - and everyone else who can read Danish - should be forced to read this letter from a mother who lost her daughter to a car driver's inattention. To You, Who Killed My Child. The truck driver who killed the boy should be given a copy to read each day in his jail cell. The arrogant indifference exhibited by the Truckers' Union should be a warning to us all that our car-centricity is out of control. Their statement should be be the catalyst for a societal paradigm shift in Denmark for a return to not only safe streets and cities but the BURNING DESIRE in the population for safe streets and cities - not to mention clear and determined action from our politicians.